At the end of May, I went to the DPRK (North Korea) for the Wonsan Kumgang Tourist Development Zone conference. Aside from the conference itself, I checked out a few other places that I hadn’t yet visited and had a great time accompanied by two of my best friends: Ju and Sol Gyong. The train arrived a little late, but I wasn’t concerned as I’d slept almost the whole way from Dandong and didn’t wake until we were pulling into Pyongyang station. It was a pleasant surprise to suddenly be there but it did lead to me jumping off the train with bed hair, stubble and an untucked shirt, which Ju and Sol Gyong found rather amusing. We checked in at the Koryo hotel where I made myself somewhat presentable, then as Ju owed me dinner for thrashing Chris Kelly at the marathon, we skipped the conference attendees dinner in the hotel and went out for Crab Hotpot, Ju also bought a bottle of Chivas to go with it which somehow matched the spicy hotpot much better than I ever imagined. The next day we had to drive to Kumgangsan but decided we weren’t in a hurry and slept in, skipping breakfast. Instead, we grabbed Kimbap and Dumplings from the Koryo shop (They were excellent by the way, the kimbap was probably the best I’ve ever had) and after a short visit to the telecoms centre to top up my Koryolink sim we started out for Wonsan, which was a fairly uneventful journey. After a leisurely lunch we started on the windy road down to Kumgangsan, stopping for a short rest break at Sijung lake. We finally arrived at 8:30 and went for dinner and a few beers before bed. Tomorrow was the conference day. The conference began at 9 am with a series of riveting speeches, followed by an introductory video and a couple of Power point backed speeches: “On the prospects for the development of the Wonsan-Kumgang international tourist zone” and “On the prospects for the development of the Mt. Kumgang international tourist special zone”. Then it was time for a short break. The coffee provided was terrible so we went and bought ice cream at the stand nearby instead- which was excellent. After our break it was time for the next round of PPT’s “On the legal climate of the special economic zone of the DPRK” and “On the prospects for the development of the Sijung Lake Area” After that it was Q and A with the questions tending to fall into one of three categories- questions about things already covered, questions better suited to the consultative meetings and tough questions that seemed to throw the answering committee somewhat. It was then time for a bit of PR so we took a group photo and attended a commemorative tree planting ceremony before dispersing for lunch. (For those looking for more information on the various projects I’ll be writing a more detailed post later about this). The next day we left Mt Kumgang and stopped in Wonsan for BBQ clams and soju along the pier then went for Lunch at the Wonsan seafood restaurant, Ju and I shared another couple of Soju’s while Sol Gyong slept hers off in the car, and had a good chat about tourism, business, politics and more. We met also the local KITC representative and confirmed the plans to soon open the Wonsan Shoe Factory and the Wonsan Orphanage to foreign tourists, which should make Wonsan even more worth a visit. (It’s already a favourite of mine). night sweating and waking from feverish dreams every hour or so. When morning finally came round I dragged myself out of bed for a hot bath which helped somewhat. Earlier we had decided to skip breakfast in favour of more kimbap from the shop but unfortunately we had to leave before it came in, so it was spring rolls instead (also good). Then it was off to the Kwangbok Supermarket. The supermarket was a definite experience and something I look forward to bringing tourists to see. Unlike hard currency shops which see a few visitors here and there this place was packed with people doing their regular shopping. Tourists can also exchange foreign currency for won and spend it here something previously only possible inside the Rason Special Economic Zone. The exchange rate was not quite as good as the markets but with 1 RMB being worth 1,224 Won (1 USD was 7,400 Won) it was fairly reasonable. (Hard currency shops price in won at the official rate of 100 Won to the dollar- however should you try and pay for those items in Won you won’t get far- they only take hard currency). On the ground floor is a supermarket and also some floor space for other items such as electronics and bicycles (Which ranged from 370,000 won to 1.5 million won). On the second floor there were textiles, sporting goods, ready made clothes and bags, medicine, watches, sunglasses and household decorating supplies as well as children’s toys. The top floor however was my favourite- the food court. Again it was incredibly busy and felt like a food court anywhere else in Asia, except for the fact that draft beer was on tap. Sol Gyong told me they have the best cold noodles here so we shared a bowl (I didn’t want to spoil lunch) and I had to agree from the first bite they were much more flavorful than any i’ve encountered. (Much better than the over rated Okryu restaurant). Sadly no photos are allowed in the supermarket. We then went for lunch at the new Stamp Shop/Exhibition restaurant. The exhibition is very interesting and the show room very modern looking. 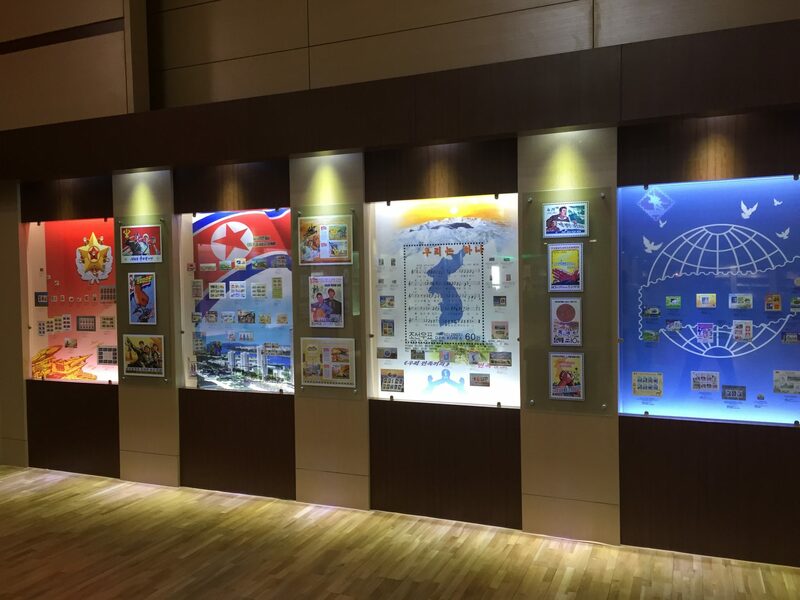 It’s a good place not just for stamp aficionados but also anyone with an interest in Korean history with lots of stamps commemorating historical moments. After lunch we went to visit the Korea Oriental Instant Medicine Development Centre, which apparently is one of the top cancer research centers in Pyongyang and met with the director Professor Ryu Il Nam. Then it was time for some more fun, so we went to Rungna Amusement park to try the new 4D cinematic rides. The cost for foreigners is 4 euro, while for locals it’s about 1 dollar. We first rode the fighter pilot one, which was exhilarating and then the underwater one which was aimed a bit more on thescary side of things (Sol Gyong screamed pretty much the whole way through). Next they played a new shooting video game, I wasn’t allowed to play as it’s brand new and they want to make sure there are no bugs in it before foreigners get to play but Ju persuaded them to let me watch. In the end Ju beat Sol Gyong by a single point- she was actually a much better shot and for most of the game was way ahead of (ex-Navy!) Ju but her arms got too tired to hold the rifle up! 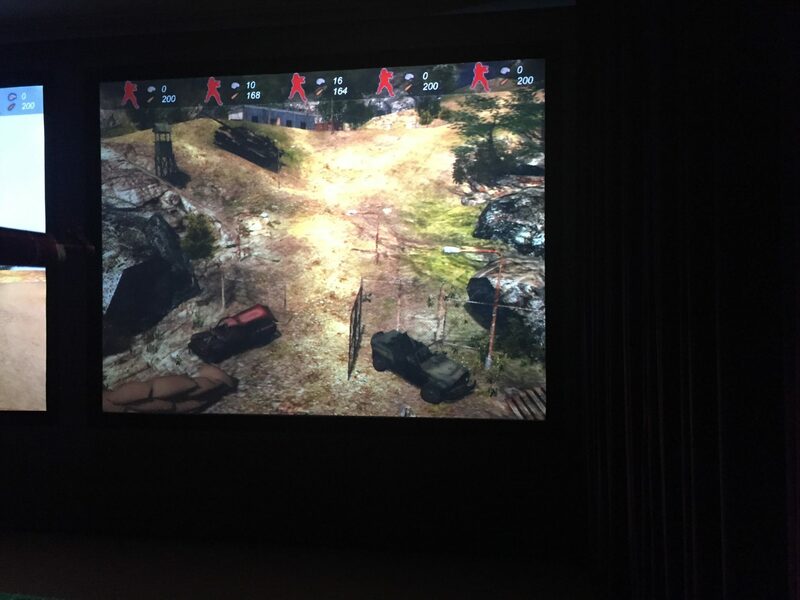 The game itself looked great, the rifles have real weight to them and the video is 3D. The aim being to shoot somewhat familiar but not clearly marked enemies from a helicopter, on foot and then later off the back of a 4WD Vehicle. After that we ate a few skewers of BBQ meat and sausage, then went for some beers with our business partner Kim at Taedonggan Number 3. We again skipped the conference dinner that was organized instead going for dinner (BBQ) and whiskey at the underground restaurant near the Koryo. After that was a late night of Karaoke and beers (Ju and I may or may not have been up until 5 am, no one can confirm or deny it), an all too short sleep and it was time to say farewell and take the train home. Click here to view YPTs wide range of DPRK tours.